The Dimpler is reversible, while chucked, push in, then turn to lock for reverse feature. Attach any 6" polishing pad, buffing pad, sponge applicator. Armature for Bosch Hammers 11245EVS, 11316 and 11317EVS. 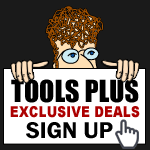 Bosch Tools SDS-Plus Chisels "ALL"